I thought about how to describe this cupcake to you. It’s got spices, but not spicy. It’s got cream cheese, but it’s not tangy. It’s like winter’s morning. 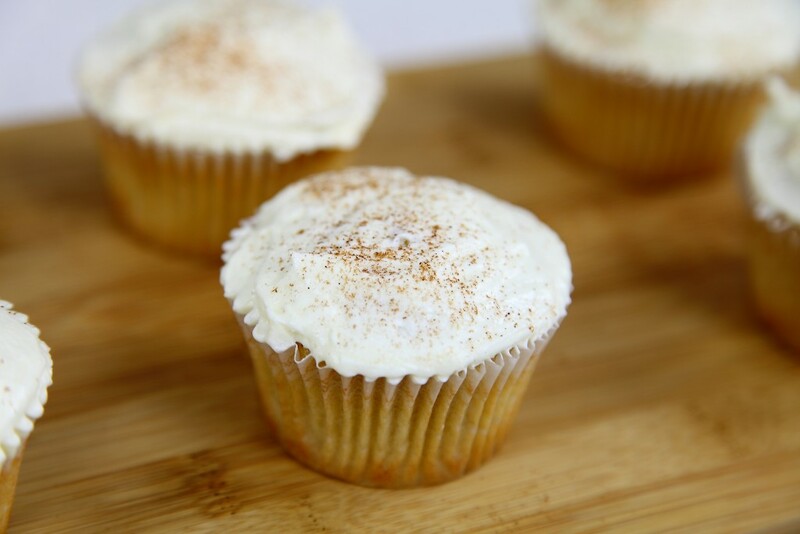 Cinnamon, spice, warmth, and every time I eat one I’m imagining it alongside a delicious mug of hot apple cider. It’s not easy getting your hands on good apple cider in Oz. The girls and I though, found a brilliant market stall at the Newcastle Hunt & Gather markets. He makes the best I’ve ever tasted. We don’t share..ever. We tried that, and two seconds later, we were back in line. I love my kids, but I love my hot apple cider too. He puts a whole cinnamon stick in every cup, and I just wish it would last the whole way home so I could enjoy it on the sofa, with my Uggs on, and a chai cupcake on my plate. In a large bowl, on the medium speed of an electric mixer, cream the butter until smooth. Add the sugar and chai powder gradually and beat until fluffy, about 2 minutes. Add the eggs, one at a time, beating well after each addition. Add the dry ingredients in three parts, alternating with the milk and sour cream. With each addition, beat until the ingredients are incorporated but do not overbeat. Using a rubber spatula, scrape down the batter in the bowl to make sure the ingredients are well blended. In a large bowl, on the medium speed of an electric mixer, cream the butter and cream cheese until smooth. Add the icing sugar, one cup at a time, until well combined. Add honey. Beat mixture on high for 5 mins, occasionally turn the mixer off, and scrape down the sides with a spatula. Store in the refrigerator or use immediately. Cupcakes iced with cream cheese must remain refrigerated until consumed.